A City report found that Bloor Street bike lanes boosted ridership by 56 per cent. Photo by Martin Reis in the Torontoist Flickr Pool. Mayor John Tory today endorsed making the pilot Bloor bike lanes permanent. His decision was based on a recommendation published this morning from city staff, who found that local business sales, along with cycling levels, were up. But what if the report had instead found a decline in sales – would the mayor instead have rejected the bike lane, despite a major increase in cycling and the improvement in cyclists’ safety? In the normal course, city councillors engage in a fanciful calculus that pretends to ‘balance’ safety on the one hand with measures such as motorists’ travel delays, business revenues, and the number of parking spots. In evaluating a bike lane, the safety of thousands of cyclists may be trumped by a few minutes’ travel delay for motorists, a decline in business revenues, or a reduction in parking. A better approach, consistent with the city’s Vision Zero Road Safety Plan, accepts the fundamental right of residents to be safe on public roads, then makes adjustments to mitigate any adverse impacts on other parties. By most measures, the Bloor bike lane has been phenomenally successful. Bloor today sometimes evokes images of bicycle-friendly cities in Europe. 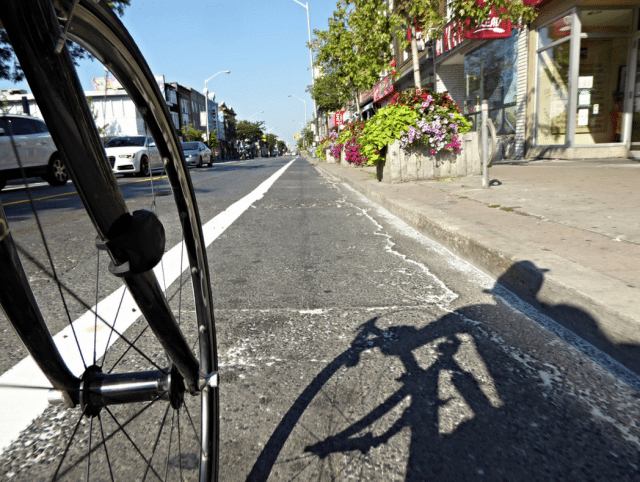 A recent City of Toronto survey found that 85 per cent of cyclists now feel safe on Bloor, compared to three per cent before the installation of the bike lane. Among local residents, there is 75 per cent support for the bike lane. Merchants are evenly split between strong support and strong opposition, with complaints centred on the loss of some parking. A majority of Bloor motorists oppose the lane given rush hour delays exceeding four minutes, although a majority also now feel comfortable driving beside cyclists. Without the positive sales numbers documented in the city report for Bloor (based on a comprehensive economic study by the Toronto Centre for Active Transportation), however, the fate of the bike lane would be much more in doubt. The Public Works and Infrastructure Committee will make its own recommendation about the bike lane on October 18 before the matter goes to the full council. Without a framework that puts safety first, we know how debates about proposed bike lanes usually play out—less than two per cent of Toronto roads have bike lanes. Since the so-called cycling “revival” in the early 1970s, one cyclist has died on Toronto roads for every kilometre of bike lane installed. From 2005 through last year, 539 cyclists were killed or seriously injured in collisions with motor vehicles. This lamentable legacy will not change until our political leaders make safety the priority, not an afterthought. For too long, the debates about bike lanes have been about whether the City “should” make a road safe for cyclists, or for residents who would cycle but for the danger. By turning the focus on “how” to make roads safe, cyclists’ safety would no longer be a privilege granted or denied based on a constantly changing array of factors. Instead of fanciful calculations that seek to “balance” safety with matters like parking spots, the community goal becomes how to make a street safe while minimizing unwanted impacts on groups such as merchants. This is precisely the approach used in the Bloor pilot. Bike lanes will not be the answer for every street. In some cases, lower speed limits (properly enforced) or an equally useful alternative route will achieve the safety goal. Where motor traffic volumes are high, however, the answer will generally be painted, or physically separated bike lanes known as “cycle tracks”—one of the design features highlighted in the Vision Zero plan. Cycle tracks have even been proven to improve pedestrian safety. Cyclists use Bloor for the same reasons as motorists—it gets them to work, school, stores, and other destinations. If the bike lane is removed, thousands of cyclists will continue using Bloor, just without the safety of a bike lane. When the public works committee reviews the pilot bike lane later this month, Robinson has an opportunity to prove her commitment to safety is real. Cyclists, pedestrians, and other road users shouldn’t have to justify their desire to be safe on public roads. Safety ought to be the starting point. Motorists, merchants, and other groups are fully entitled to propose changes to mitigate unwanted impacts of new safety infrastructure but not to decide who has the right to be safe. After all, travel delays can be reduced, additional parking found, and the fortunes of an ailing business reversed, but a person killed on our roads cannot be revived nor one with debilitating injuries restored to health. Dr. Eileen Cheung is an emergency room doctor in Toronto. Albert Koehl is an environmental lawyer and founder of Bells on Bloor. He served on the Ontario Chief Coroner’s expert panel on road safety in 2012.